Donald Trump and Louisiana’s new governor on Podcast for America. The Beginning of the End for Trump? Probably Not. But Rubio’s starting to look OK.
Republican presidential candidate Donald Trump speaks to guests following a town hall meeting on Nov. 19, 2015, in Newton, Iowa. Photo illustration by Juliana Jiménez. Photo by Scott Olson/Getty Images. Listen to Episode 27 of Podcast for America! Podcast for America is your inside look at the perhaps unsurprising bigotry of the current presidential campaign cycle. Your hosts are Annie Lowrey of New York magazine and Mark Leibovich, national correspondent for New York Times Magazine. They’re joined this week by Mike Pesca of Slate’s The Gist podcast. 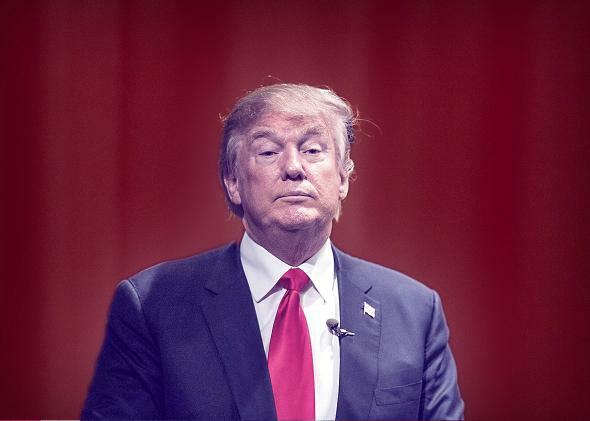 This week: What would it take to unseat Donald Trump from the top of the polls? Probably a miracle, although Marco Rubio and Ted Cruz are making surprisingly good showings lately. Also, Louisiana has a new governor-elect, John Bel Edwards, and surprise! He’s a Democrat. But is it any real surprise when he was running against Sen. David Vitter? And finally, we revisit the Democrats to examine Bernie Sanders’ lame foreign policy credentials and Hillary Clinton’s pretty good momentum.